Precision Environmental and ProCut have both been named as recent recipients of the 2017 Safety Council Award, given by the Construction Employers Association to companies that have demonstrated excellence in one of several safety categories. Awards for both companies focus on lost time incident rates over a pre-determined timeframe. 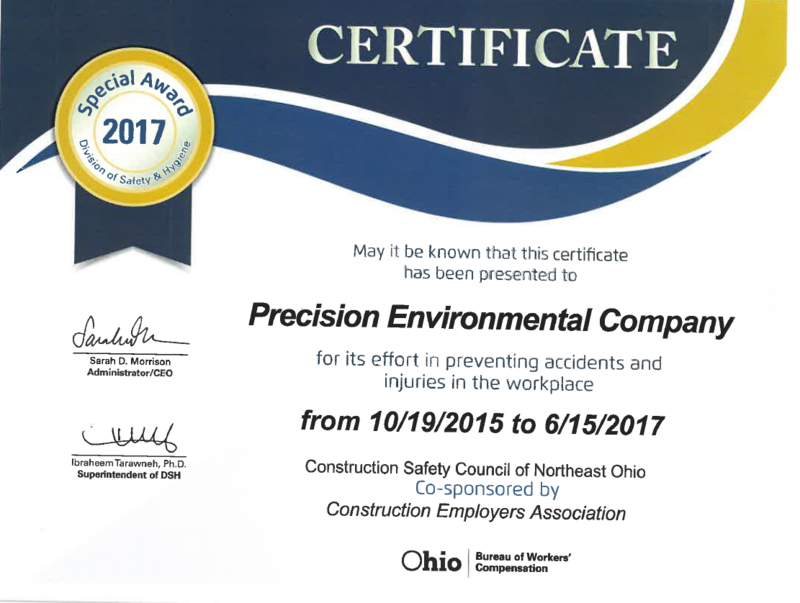 Specifically, Precision Environmental won their award for Ohio Bureau of Workers’ Compensation Division of Safety and Hygiene Special Award, for the time-period of October 2015 through June of 2017 with a minimum of 500,000 hours and at least six months without an injury resulting in a day or more away from work. ProCut earned the Ohio Bureau of Workers’ Compensation Division of Safety & Hygiene 100% Achievement Award for 2017, which acknowledges zero injuries or illnesses resulting in a day or more away from work in the previous calendar year. The entire organization is grateful to the field workers and supervisors, who make a point of keeping safety their top priority each and every day, and who have made winning awards such as this possible. We would also like to thank the Construction Employers Association for recognizing the dedication both companies have toward maintaining safe and optimal work environments on all jobs and projects. Precision Environmental is an industry leader in the asbestos abatement, selective demolition and remediation business for more than 30 years. In that time, Precision and ProCut have forged relationships with, and has performed its services for, some of the largest entities in the region in a variety of markets including heavy duty construction, commercial, government, colleges & universities and the health care industry. Precision is set apart by its dedicated workforce and depth of experience among its people. Our strength is built upon the rich and proud history as one of the DiGeronimo Companies, which has been in the construction industry in the region for more than 70 years. 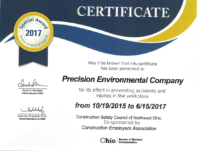 Certificate presented to Precision Environmental Company for its efforts in preventing accidents and injuries in the workplace for 21 months from 10/19/2015 to 6/15/2017.